I hope your all smiling and well, there’s only 10 days until Christmas. As I didn’t have time to get some good photos for today’s post I thought I’d do it anyway as I was really excited about and I will post some pictures on Instagram when I get the chance instead. So today I’m sharing with you one of my favourite recipes for one of my favourite things.. BROWNIES! I thought this would be a perfect post as well as having Christmas just round the corner this would be a perfect treat as it’s quick and easy. 1 box (1 lb 2.4 oz) of original brownie mix. Water, vegetable oil and egg called for on brownie mix box. 2 to 3 drops green food colouring. 2/3 cup of Rich & Creamy vanilla frosting. Miniature candy canes and any other decorative sweets or candy. 1// Heat oven to 350°F (325°F for dark or nonstick pan). Line 9-inch square pan with foil so foil extends about 2 inches over sides of pan. Grease bottom only of foil with cooking spray or shortening. 2// Make and bake brownie mix as directed on box. Cool completely, about 1 1/2 hours. Remove brownie from pan by lifting foil; peel foil away. 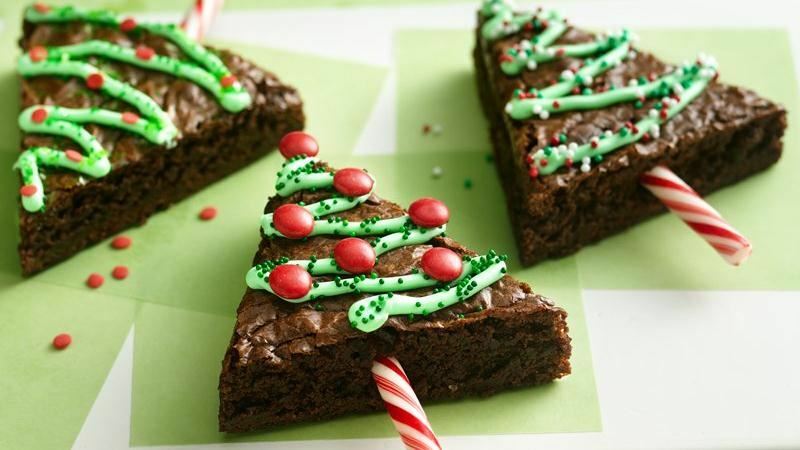 To cut brownie into triangles, cut into 3 rows. Cut each row into 5 triangles, see diagram. Save smaller pieces for snacking. 3// Stir food color into frosting. Spoon frosting into small resealable food-storage plastic bag; partially seal bag. Cut off tiny bottom corner of bag. Squeeze bag to pipe frosting over brownies. Sprinkle with decors. 4// Break off curved end of candy cane; insert straight piece into bottoms of triangles to make tree trunks. I hope you try making these if you do, let me know in the comments with how they turn out. What’s your favourite chocolate treat? Comment Below. « Blogmas day 14//Stationery Must Haves!